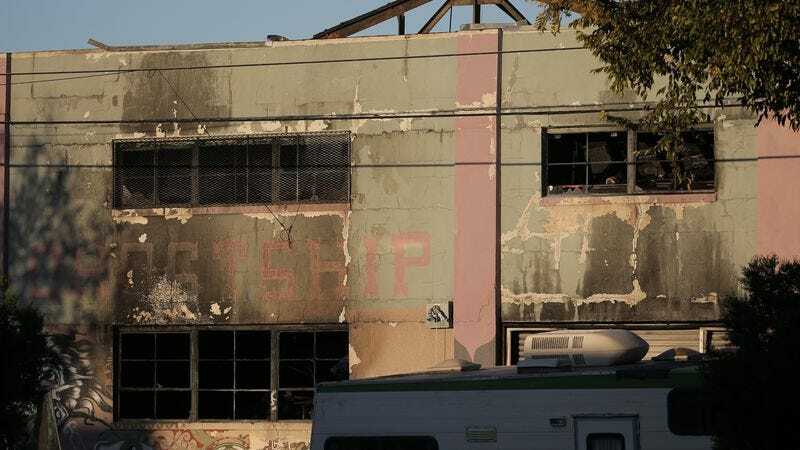 Variety is reporting that at least nine people have died in a fire that broke out at a party being held in an Oakland, California warehouse last night by electronic music record label 100% Silk. The event was part of a West Coast tour for Wisconsin-based DJ Joel Shanahan, who performs under the stage name Golden Donna. According to his Facebook page, Shanahan is alive, but shaken and upset. More than 20 people are reportedly still missing in the aftermath of the fire. The event’s Facebook page is currently being used as a way for people to locate and collect information on attendees who are still missing. No information has been released about the cause or course of the fire. Meanwhile, authorities are still attempting to explore the burned-out building, which was apparently an artists’ collective with a number of safety concerns: inactive smoke alarms, no sprinklers, packed corridors, and a second floor accessible only via a staircase made out of wooden pallets. Firefighters and police are continuing to work to establish an accurate accounting of survivors and victims; between 50 and 100 people were in attendance last night, and multiple outlets say authorities are worried that the death count could number as high as 40 lives lost.